For as long as humans have pounded drums and plucked strings, listening to music has affected people's sense of well-being, lifting their spirits and  as new research shows  calming their nerves. Literally. According to a study at Cleveland Clinic, music can slow the neuronal firings deep within the brain during surgery designed to treat Parkinson's patients. The seeds of this study were planted about two years ago, when a patient named Damir Janigro was being prepped for spinal surgery. Janigro, who is also a neuroscientist at the clinic, lay captive to the nerve-racking din of the operating room and in his frazzled state thought about how dentists often give their patients earphones to help ease anxiety. If people getting root canals merited a musical intervention, he thought, why not people undergoing brain surgery? Patients with conditions such as epilepsy, brain tumors, severe depression, and obsessive-compulsive and motor disorders like Parkinson's have to be awake for surgical procedures that often take several hours. Janigro and his team decided to use that wakeful period to determine whether music made the subjects' experience in the operating room less stressful. He will present his findings on Oct. 30 as part of a symposium in New York City on music and the brain. The son of a world-renowned cellist, Janigro specializes in studying epilepsy and is associated with Cleveland Clinic's Arts and Medicine Institute, which is working to advance our understanding of how music can do such things as help decrease pain and blood pressure and improve movement in Parkinson's patients. The medical community has long been interested in how the brain is affected by music. Historically, however, most research was linked to the cortex, the brain's outer layer, which is associated with functions like memory, consciousness and abstract thought. In those studies, neurosurgical patients, wide awake with their cortex exposed, listened to certain sounds and music. While their neural activity was being recorded, they told researchers how those selections made them feel. Janigro wanted to perform similar studies on motor centers deep within the brain. Because music is often associated with movement  like tapping one's feet  he theorized that music could be used to modify the activity of thalamic and subthalamic neurons, which are located in the same area where a neuronal pacemaker is implanted during deep-brain stimulation. 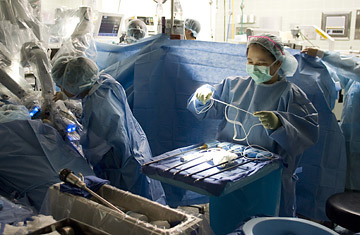 In Janigro's study, more than a dozen neurosurgical patients, predominantly with Parkinson's, listened to three musical selections  rhythmic music with no discernible melody (by Gyorgi Ligeti, of Stanley Kubrickmovie fame), melodic music with undefined rhythm (by Aaron Jay Kernis, a Pulitzer Prize winner) and something in between (Ludwig van Beethoven). In the later stages of the research, to prevent familiarity from swaying the subjects' responses, music was specifically composed for the study by students from the Cleveland Institute of Music. In the end, patients almost unanimously said the purely melodic offerings were the most soothing. But the recordings of their brain activity were eye-opening. Listening to melodic music decreased the activity of individual neurons in the deep brain, says Janigro, adding that the physical responses to the calming music ranged from patients' closing their eyes to falling asleep. Some patients even settled into a nice round of snoring. And when lead neurosurgeon Ali Rezai needed patients to perform an action, such as lifting a limb, during the procedures, he simply removed their earphones and relayed instructions. Once the music resumed, patients returned to their snoozing. These are very desirable results, says Janigro. With the right music, he says, patients can be more relaxed in the operating room. And that relaxation may mean not only that procedures involve less medication  to control blood pressure, which increases with stress  but perhaps that patients have quicker recovery times and shorter hospital stays. Janigro anticipates that following institutional approval, music will be used during certain neurosurgical procedures at the clinic as early as 2010. He hopes other hospitals will soon follow Cleveland's lead. "This type of surgery can be a traumatizing experience, and using music can decrease anxiety," he notes. And you can't beat the cost. With health-care expenditures through the roof, this patient benefit is practically free, says Janigro, who used his own iPod and that of a colleague's to pump in the music for the study. "The clinic doesn't have a budget for iPods yet, but soon I think we will. It's a no-brainer," he says. "There's nothing more calming than sleep." See TIME's health and medicine covers. Watch TIME's video "Uninsured Again."